← Do I need them? 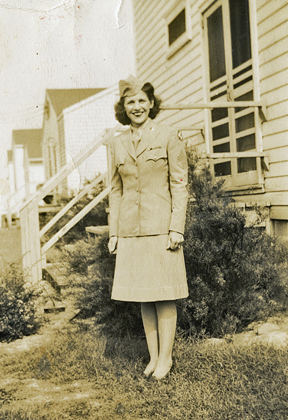 Mama had joined the Women’s Army Auxiliary Corps in January of 1943. The WAAC was the predecessor to the Women’s Army Corps, but the women soldiers didn’t have military status. The WAACs were needed overseas, but the Army couldn’t provide them protection, if captured, or benefits, if injured. In March of 1943, Congress opened hearings on converting the auxiliary unit into the Women’s Army Corps, which would’ve made the women part of the Army with equal pay, privileges, and protection. It would also make a much larger army and let the women take over some of the jobs men were doing, so the men could go fight. Mama was stationed in Ft. Oglethorpe, Georgia, the Training Center for the Women’s Third Army Corps. She had volunteered for Cooks and Bakers School because she came from a family of ten children and she thought she’d be good at cooking for a crowd. She was issued all the corps’ uniforms, but the cooks wore white short-sleeved dresses when they worked. On April 17, 1943, Mama was in cooking school wearing her white uniform. A parade was scheduled on the post that day. The soldiers were expecting somebody important, a high up, but they didn’t know who it was. Mama was hoping for the president. She asked her instructor for permission to go, and her teacher said yes, and told her to put on her Army overcoat and button it all the way up to her neck to cover every inch of the white uniform. Everybody else was already gathered at the parade grounds. As Mama ran out of the training center and down the sidewalk, a cannon began to fire, announcing the arrival of the guest. She counted the shots. 1, 2, 3. She got to the end of the sidewalk. 4, 5, 6. She ran down the steps. 7, 8, 9. She neared the street. 10, 11, 12. The cannon blasts kept coming.13, 14, 15. She saw a black car approaching. 16, 17, 18. She stopped at the curb. 19, 20, 21. She froze. Twenty-one shots. That’s HIM! The President of the United States of America was in the black open-air vehicle coming right at her. She collected herself and did what she was trained to do. She stood at attention, straight as a board. She saluted. She had to get the salute exactly right, at the tip of the hat. She knew to hold it until it was returned. The car stopped right in front of her. President Franklin D. Roosevelt sat in the back seat of the convertible, close enough for her to put her hand down and touch him. She looked right into his eyes. His dog Fala, a Scottish terrier who could curl his lips into a smile, was sitting in the President’s lap. Colonel Oveta Culp Hobby, the female director of the women’s corps, was sitting beside the president. They both saluted Mama. That day, President Roosevelt reviewed three thousand WAACs on the parade grounds at Barnhardt Circle and inspected the women’s training program to determine for himself whether they should become part of the Army. On July 3, 1943, three months later, he signed the bill into law, and the Women’s Army Corps was born. Mama was most likely the first soldier the president inspected on the post that day. I think Mama was the reason the auxiliary unit became the Women’s Army Corps.